What does the scratched-up canoe that sits outside geologist Brian Atwater's Seattle home have to do with the destructive power of tsunamis? Quite a bit: it was in this canoe, paddling around the salt marshes and tidal flats of Washington State, that Atwater discovered evidence of earthquakes and giant waves of a magnitude that seemed, to many, inconceivableuntil late last year, when a tsunami of similar power tore across the Indian Ocean, killing more than 200,000. 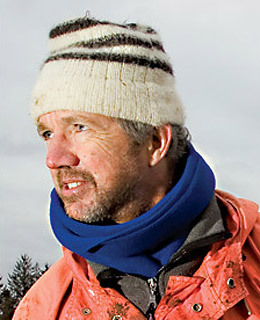 Atwater, 54, a scientist with the U.S. Geological Survey, didn't set out looking for big waves. He was studying a feature in the earth's surface known as the Cascadia Subduction Zone, a 600-mile-long battlefront where a rogue piece of oceanic crust is jerkily shovelnosing beneath the North American continent. Some scientists viewed the zone as a benign anomaly. Others feared it posed a real threat to the people of the Pacific Northwest. What Atwater found, paddling around in his canoe, confirmed the worst fears. He found layers of sand transported far inland, clear evidence of past tsunamis. He found ghost forests standing in marshes that, centuries earlier, had been dry ground. And he found, in layers of underlying sediment, sure signs that nearly naked tidal flats had repeatedly replaced both forests and thickly vegetated marshes. The cause of these changes, Atwater knew, must have been intrusions of seawater due to a downward lurching of land. The same violent earthquakes that transformed forests and marshes into barren mudflats also triggered the tsunamis. The detective story does not end there. In 1996, Japanese scientists published a paper about an "orphan" tsunamiof unknown originthat inflicted widespread damage on the shoreline of Japan's Honshu Island in 1700. The most logical candidate for the orphan's "parent," they suggested, was the earthquake that, according to evidence collected by Atwater and others, had struck the Pacific Northwest at just about the same time. Since then, scientists have nailed down the evidence, if anyone needs it anymore, that waves triggered by an upheaval on one side of an ocean can wreak enormous damage on the other.